If you have flat feet, the arches in your feet have lowered, and disappear completely when you're standing. This can cause ankle, knee and low back pain. 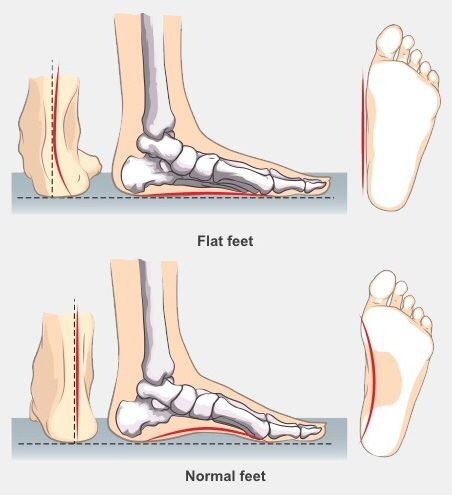 Flat feet are also called fallen arches, pronation, and pes planus. For most people, having flat feet is caused by genetics – it runs in their family. You may also have extra bones in your feet, and that makes them flat. They can also be caused by injury, such as a broken bone, dislocation, or sprain, and by diseases such as diabetes and arthritis. Being overweight can also lead to flat feet. Flat feet in children usually correct as they grow and don't need any treatment. However, if your child begins to walk oddly or clumsily, for example on the outer edges of their feet, or complain about calf or muscle pains around their feet, you should see a doctor or podiatrist to get their feet assessed. uneven wear on your shoes. Making sure you have supportive footwear, especially for activities such as running, can help to prevent the symptoms of flat feet. You may need to see a podiatrist to get orthotic inserts for your shoes. It's also important to stay a healthy weight, as excess weight puts strain on the ligaments, muscles and joints of your feet. You should see a podiatrist if you have any pain from your flat feet. A podiatrist can examine your feet and look at how you walk or run. They can then prescribe custom-made orthotic inserts for your shoes, and may recommend surgery in some cases. You can find a podiatrist by searching on Podiatry NZ's website.